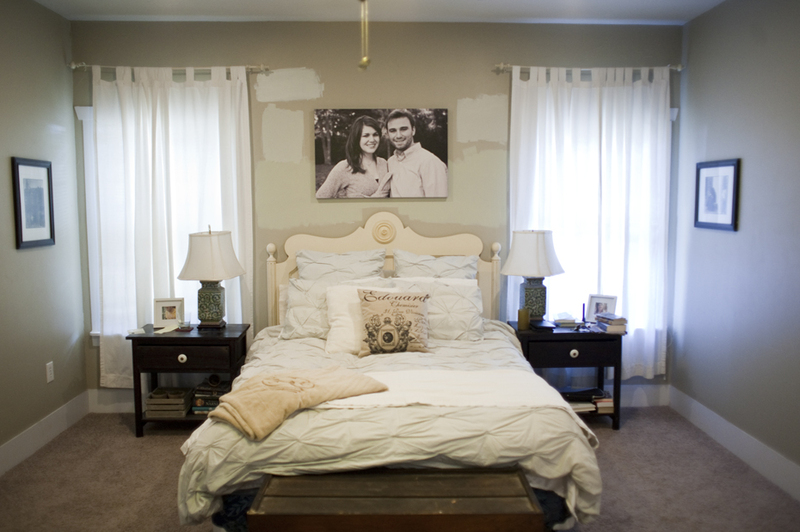 So now that you’ve seen two peeks of our Master Bedroom, are you ready to see the final product? Well you are in luck. So Matthew and I had been living in our room with four different colors on all of the walls while we mulled over our choices. See the shot below – our current before photo. Notice the four different shades of light, muted green. Notice one is not so light and muted…yeah, that was the immediate no which took me to Lowes for the next three. In this photo, please also note the droopy curtain rods and high water curtains. We threw the curtains we had on hand when we moved in, so our windows didn’t look so bare, onto the droopy rods left here by the previous owner. So the paint color we selected is the middle color on the left of the canvas. It is a light green/blue color that looks white as it goes on the wall but dries a beautiful, soothing color. 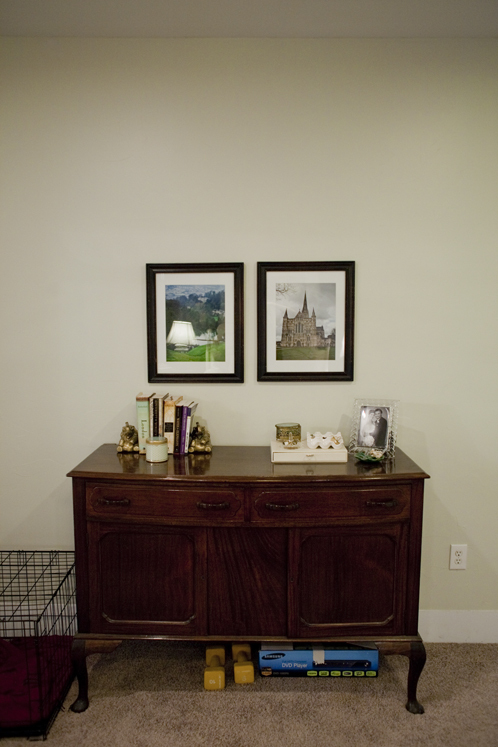 The actual color we chose is Olympic Plantation Moss. A note for prospective paint buyers – Olympic One smells terrible. So terrible that I had to stop several times while painting and breathe in fresh air to get rid of the head ache I received while using this paint. The Valspar paint we used in the bathroom was almost odorless. And yes, our two widows were open with the bathroom windows open as well. 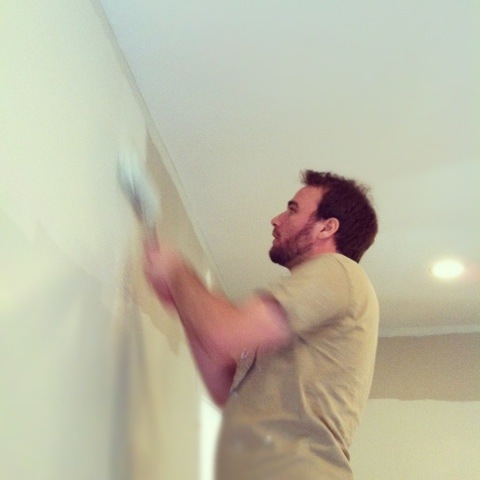 But before we could get to painting, we had to do a little patching. Because we live in a house built in 1912 and because the ground below us is made up of a lot of clay, the ground shifts a lot, which means a lot of settling. Thankfully the cracks in our house aren’t bad at all. They are very manageable. I’ve already spoken about fixing the cracks here a little bit. So on Friday night we prepped the room for painting in hopes of having a more productive Saturday than when we painted our bathroom. And here is our current “after” photo. We’ve made a lot of progress since moving in, which I am thrilled about. 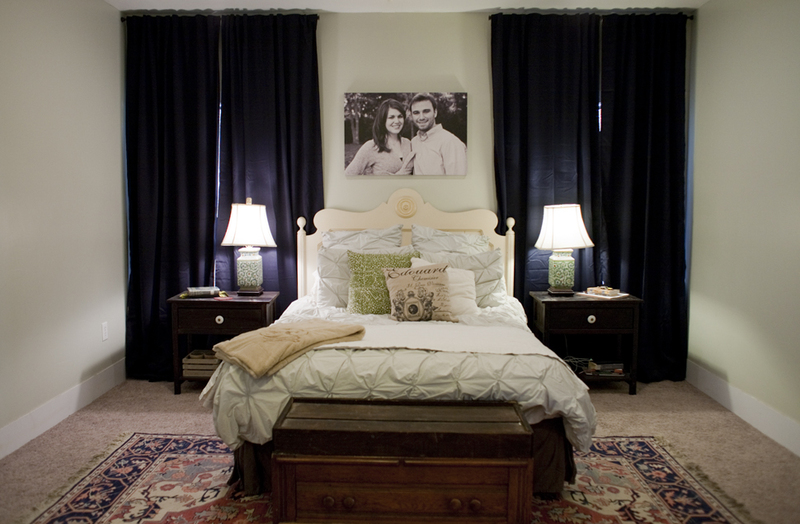 We never had a finiahed bedroom in our other house, so this room was definitely a room we wanted to tackle soon after moving in. Now I know that eight months into our house isn’t exactly “soon” but when you are young and on limited funds, eight months is as soon as we could do it. 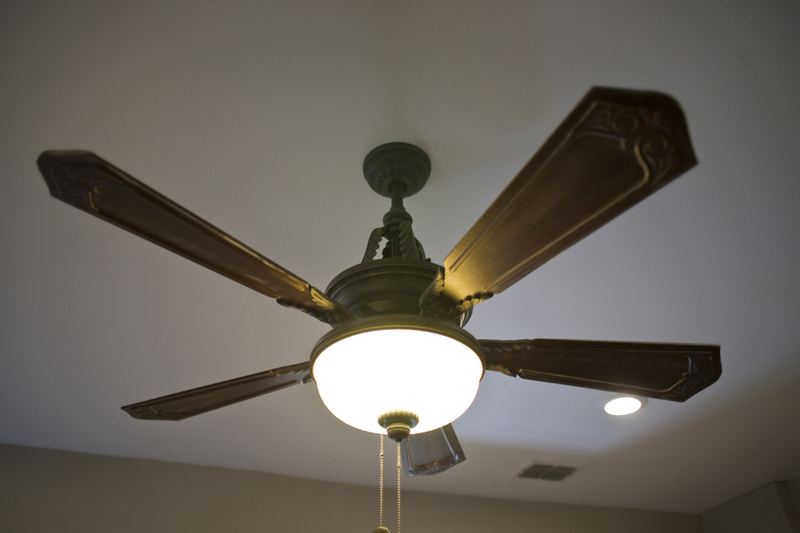 One other project still needs to happen in this room (besides removing that fan), and that is building our bed…or hiring someone to build it. One note about the bed, if you gave us Home Depot cards for Christmas, you funded the materials for our bed, so thanks in advance. Ok, you ready for the after now I mentioned it several lines up? 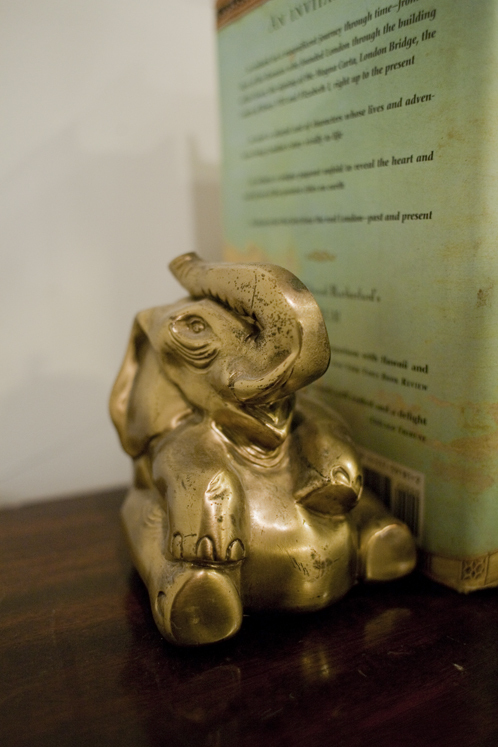 A couple of elephant book ends that I brought home to San Antonio after visiting my parents shortly after Matthew and I got married. She had them for as long as I can remember and now they sit in our room. I love them against the new wall color. And our side tables. Matthew and I built these very soon after we moved into the house. It was our first project together with our tools that my dad gave us when we moved in. Thanks, dad! We still each have ten fingers and ten toes! 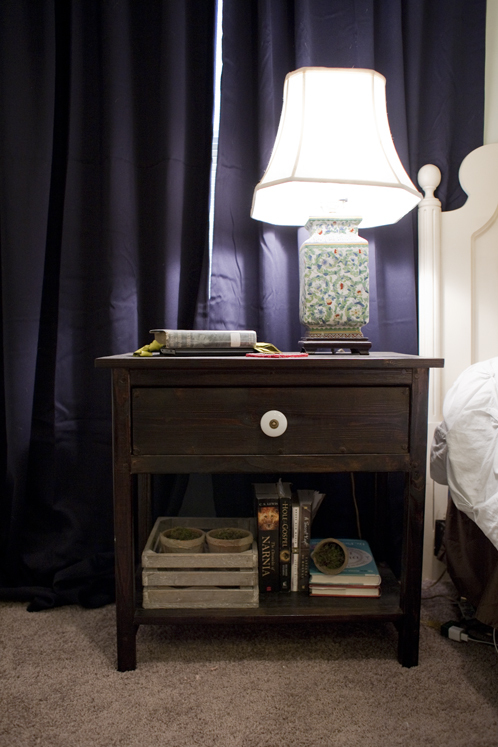 If you want to read more about our side tables, head on over to my photography blog [here] where you will see an even earlier “before” photo of our bedroom. That’s all for now. Have a great weekend! 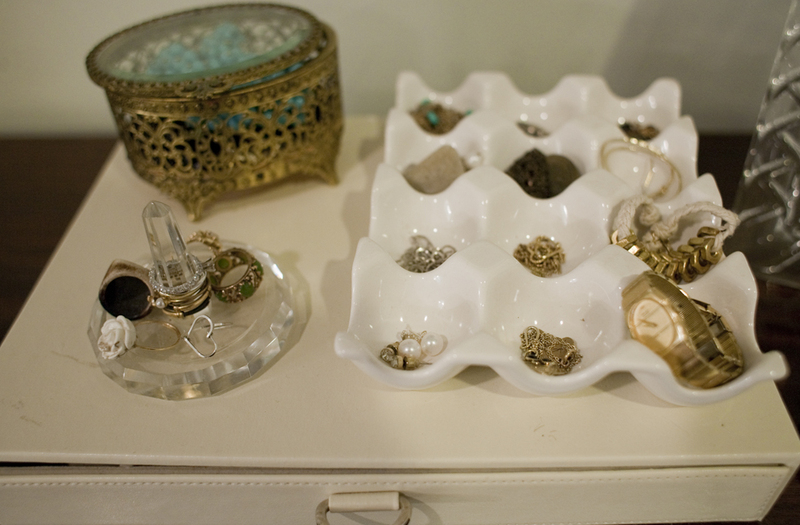 Mine will be spent dreaming about my next project – which will most likely be finished my desk drawers.